Barons’ annual British Heritage sale at Sandown Park on September 7th will be headlined by a ‘lost’ 1958 Aston Martin DB 2/4 MK111 drophead coupé that was originally owned by David Brown – the then owner of Aston Martin, after whom the iconic ‘DB’ models were named. Just 84 drophead coupés were built, and this particular example was first registered to David Brown before passing into his wife’s ownership. It was subsequently sold to a Yorkshire mill owner and was regularly serviced by Aston Martin, before being acquired by a London-based architect who sold it to the vendor in 1974. 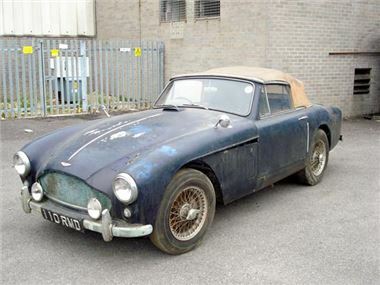 For the past 30 years it has remained unused and stored on a trailer, and has emerged from beneath its tarpaulin to present a fascinating rolling restoration project (estimate: £80,000-£100,000). “It is amazingly sound, and complete with its 2922cc engine, original buff logbook and workshop manuals and a comprehensive history file. ‘Lost’ cars of such importance come along very rarely and, with the direct association with such a pivotal figure in Aston Martin’s history, it should be a hugely rewarding project,” said Barons’ MD Laurence Sayers-Gillan. Talbot Darracq, Bentley, Rolls-Royce, Jaguar, ‘Corgi’ Lotus Cortina – and Royal Mail. Other notable entries for the September 7th sale include a very beautiful and extremely rare 1934 Talbot 75 Sports Saloon with coachwork by Darracq. Thought to be one of just five examples built, it was originally ordered by the British Ambassador to Spain but was never delivered. It was displayed on the Talbot stand at the 1934 Motor Show and in 1936 it was bought by a Mr Steed – and remained in the Steed family until 2009 (estimate: £34,000-£40,000). No British Heritage sale would be complete without Bentleys, Rolls- Royces and Jaguars, and Barons’ auction has a fine selection of these quintessentially British marques. This includes an elegant 1935 Rolls-Royce 20/25 Limousine (£43,000-£48,000) and a stately 1958 Bentley S1 (£22,000-£27,000). The ‘big cats’ include three splendid XK roadsters, headed by a magnificent 1958 XK150 which has been fully restored by Grace Jaguar and upgraded by Vicarage (£75,000-£95,000). The sale also includes a charming piece of British social history – a 1954 Morris Royal Mail van with black rubber front wings (£8,000-£10,000) – and ‘KUU 33D’, the 1966 Ford Lotus Cortina used as the model for the popular Corgi Classics model of the 1980s and ‘90s (£35,000-£45,000). For further information please visit www.barons-auctions.com, email info@barons-auctions.com or call 08454 30 60 60.